Which One Do I Need? Which Cable Do I Need? 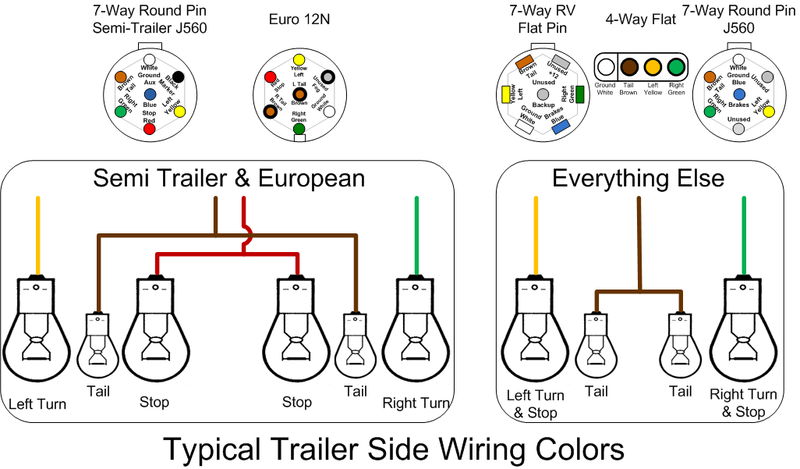 These are the typical tail light wiring colors found on trailers. Semi-trailers and European caravans have separate turn and stop lamps and "Everything Else" is usually wired for shared turn/stop lamps. Dual filament bulbs may be used to provide both tail and turn/stop functions in a single bulb, but they are wired like two separate light bulbs. Base of single filament "1156" bulb on left, dual filament "1157" bulb on right. 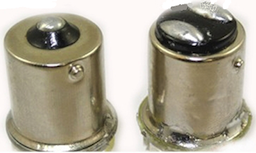 The 7-Way Round Pin J560 connector has two common wiring variations, depending on application. The semi-trailer variation has separate stop lamps and no provisions for electric brakes. The "Everything Else" variation can be used with electric brakes and uses shared stop/turn bulbs. When working with 5th wheel, gooseneck or tag trailers that have a 7-Way Round Pin plug, you need to verify if they have shared or separate turn and stop lamps.